A Fine French 19th-20th Century Silver and Gilt Plated Surtout de Table Centerpiece with Candelabra, Attributed to Christofle. The elongated shaped body surmounted with a pair of cylinder flower vases at each end, four single-light candle-holders and a mirror plate. Circa: Paris, 1900. Charles Christofle (d. 1863) took over his brother-in-law's bijouterie-joaillerie 'Maison Calmette' in 1831, and changed its name to 'Société Charles Christofle & Cie'. 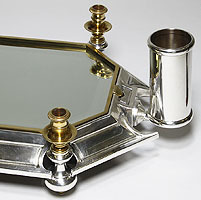 Following the invention of electro-metallurgy techniques by the English firm Elkington & Co., Christofle turned away from jewellery and, from 1844, concentrated on the production of large-scale works in electroplate, solid silver and gilt-bronze. Shortly thereafter, Christofle was appointed Fournisseur officiel du Roi Louis-Philippe, and in 1855, Fournisseur de l'Empereur. 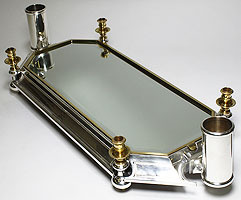 Christofle supplied fine quality pieces, predominantly table-wares, to the various palaces and ministerial offices of Napoleon III. Charles was succeeded by his son Paul and his nephew Henri Bouilhet, and under their direction, the firm exhibited at the major international exhibitions throughout the 19th century. A Fine French 19th-20th Century Silver and Gilt Plated Surtout de Table Centerpiece with Candelabra, Attributed to Christofle. The elongated shaped body surmounted with a pair of cylinder flower vases at each end, four single-light candle-holders and a mirror plate. Circa: Paris, 1900. Charles Christofle (d. 1863) took over his brother-in-law's bijouterie-joaillerie 'Maison Calmette' in 1831, and changed its name to 'Société Charles Christofle & Cie'. 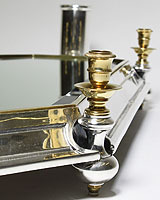 Following the invention of electro-metallurgy techniques by the English firm Elkington & Co., Christofle turned away from jewellery and, from 1844, concentrated on the production of large-scale works in electroplate, solid silver and gilt-bronze. Shortly thereafter, Christofle was appointed Fournisseur officiel du Roi Louis-Philippe, and in 1855, Fournisseur de l'Empereur. Christofle supplied fine quality pieces, predominantly table-wares, to the various palaces and ministerial offices of Napoleon III. Charles was succeeded by his son Paul and his nephew Henri Bouilhet, and under their direction, the firm exhibited at the major international exhibitions throughout the 19th century.